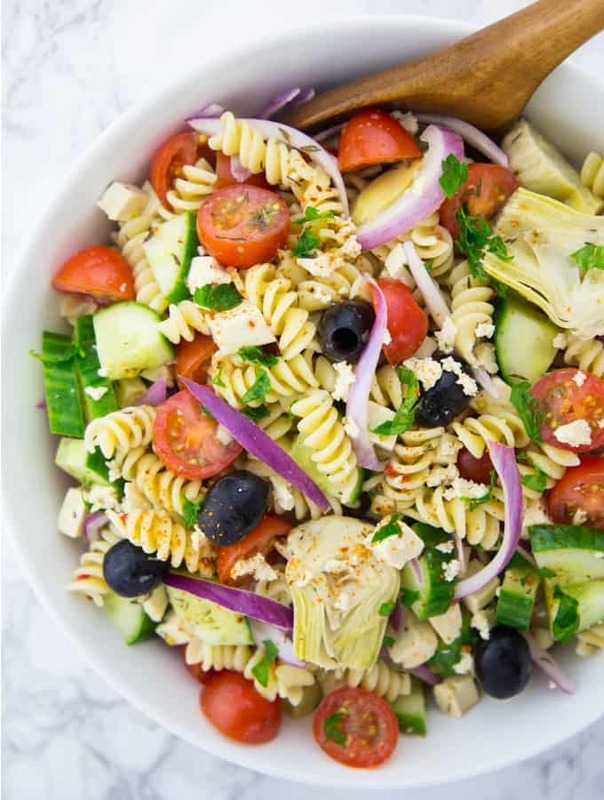 This easy Greek pasta salad is perfect for BBQs and picnics! It’s fresh, easy to make, healthy, and vegan. The perfect recipe to make for your next party or potluck! I’m SO ready for summer! And pasta salad is definitely a sign for summer or at least spring. So I got so excited when I made this Greek pasta salad with artichoke hearts and olives the other day. We used marinated tofu instead of the feta to make vegan feta. And it turned out to be so yummy. We just couldn’t get enough of it! 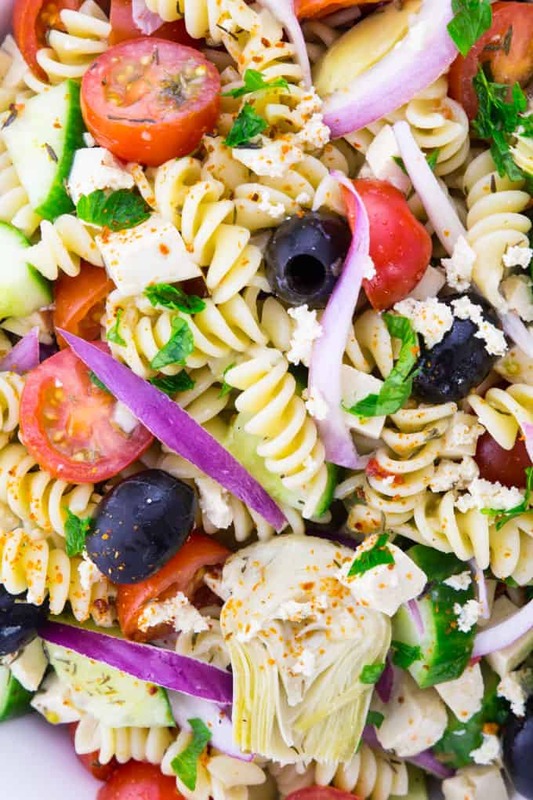 You can find all of the ingredients for this Greek pasta salad in any regular grocery store. 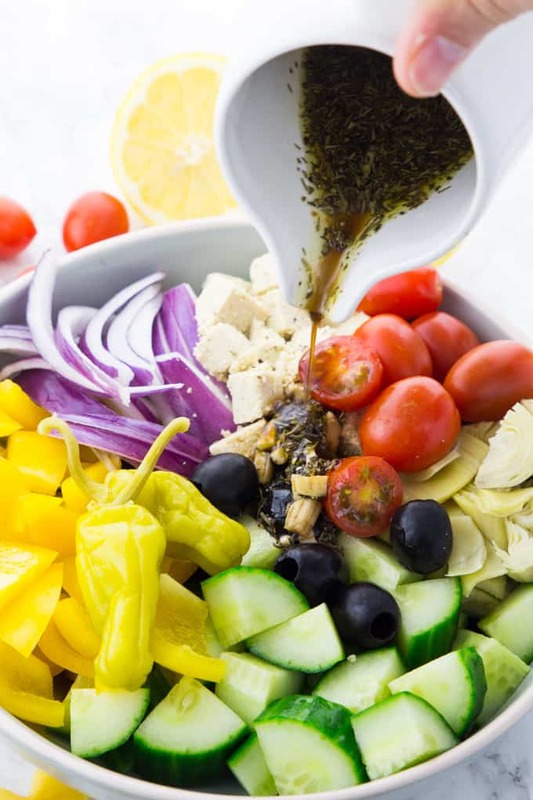 As always, you can find the full recipe for this vegan Greek pasta salad in a separate, printable recipe box at the end of this post. Basically, you can use any pasta you like for pasta salads. I usually use rotini or farfalle like I did for my Southwestern pasta salad. When choosing your pasta, just consider that short pasta is easier to eat than for example spaghetti. Especially when you bring your pasta salads to parties or other gatherings where you don’t necessarily eat at a table, this might make things a lot easier. It’s also important that you don’t cook the pasta too long so it doesn’t get mushy. Check out this helpful article about five mistakes to avoid when making pasta salad to get even more information. You can use this simple Greek vinaigrette on basically everything! It’s a delicious salad dressing and also great on roasted vegetables. Or you could use it to marinade fresh vegetables for your next BBQ. I also love dipping bread in this easy Greek vinaigrette. And sometimes I even use it for oven-baked potatoes! They add additional flavors to the dressing. Always make sure to use dried herbs for your Greek dressing. Fresh herbs are likely to wilt and they might turn black. Besides, it’s also easier to add flavor with dried herbs. If you feel more like a creamy sauce, you can also add yogurt to the vinaigrette. When using vegan yogurt, make sure it’s unsweetened coconut or soy yogurt. I also love using balsamic vinegar instead of red wine vinegar for my Greek dressing. It gives the dressing a more intense flavor than red wine vinegar. Always make sure to use a good-quality vinegar! I usually make a double or even triple batch and just store it in the fridge. This is perfect for busy weeknight dinners or even lunch. Just chop up some vegetables, add some lettuce, and maybe some sort of protein and you’re good to go! This Greek pasta salad is actually very good on its own. It makes such a great lunch to bring to work with you. However, it’s also perfect for BBQs and you can eat it with basically anything from the grill. It’s also delicious with some grilled garlic bread on the side. If you’re looking for vegan grilling recipes, you could also like my roundup of 30 vegan BBQ and grilling recipes. Yes, it’s definitely possible to enjoy a delicious Greek pasta salad without feta. Feta is usually made from sheep’s milk and it’s very common in Greece. Sometimes it’s also made from goat’s milk. You can use it for all kinds of salads or even in grilled sandwiches and pastries. For people who don’t like the tangy and mildly sour taste of feta or who avoid animal products like me, vegan feta can be a great alternative! I used to love feta cheese before I became vegan. I often used it for Greek salads and I also loved baked feta in the oven with cherry tomatoes and lots of fresh herbs on top. So when I became vegan, I started looking for a vegan alternative to feta. However, I couldn’t find anything in the stores or even online. So I started to make my own vegan feta and it turned out to be so delicious! I marinated tofu in apple cider vinegar and lemon juice, which mimicked the tangy and sour taste of feta. For more flavor, I added dried thyme and lots of garlic. You can find the full vegan feta recipe in a separate recipe card at the end of this post. 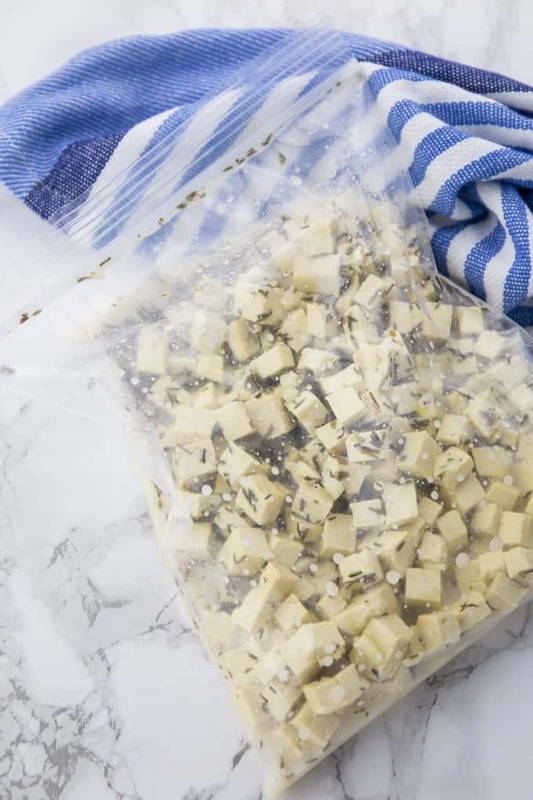 I usually marinate the vegan feta overnight in a ziploc bag. If you don’t have much time, you could also get away with marinating it for about 4 hours. But it’s definitely better if you marinate it for a longer time. Also make sure that you got a very firm tofu. It makes the best texture! If you’re looking for more vegan cheese recipes, I also got a post with 30 vegan cheese recipes for you. 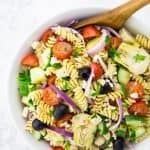 I hope you like this Greek pasta salad as much as we do around here! 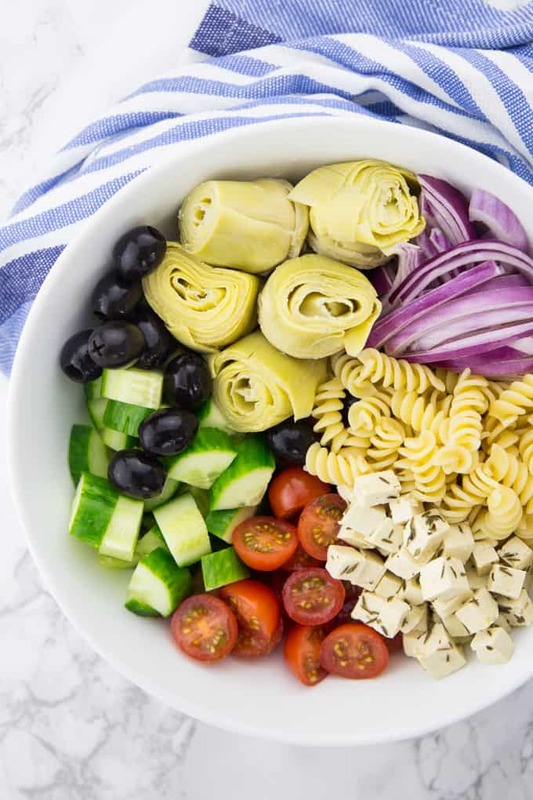 You might also like my California pasta salad or check out my roundup of 15 amazing vegan pasta salad recipes for even more inspiration. Let me know if you give it a try. I also love seeing your Vegan Heaven creations and hearing from you guys! 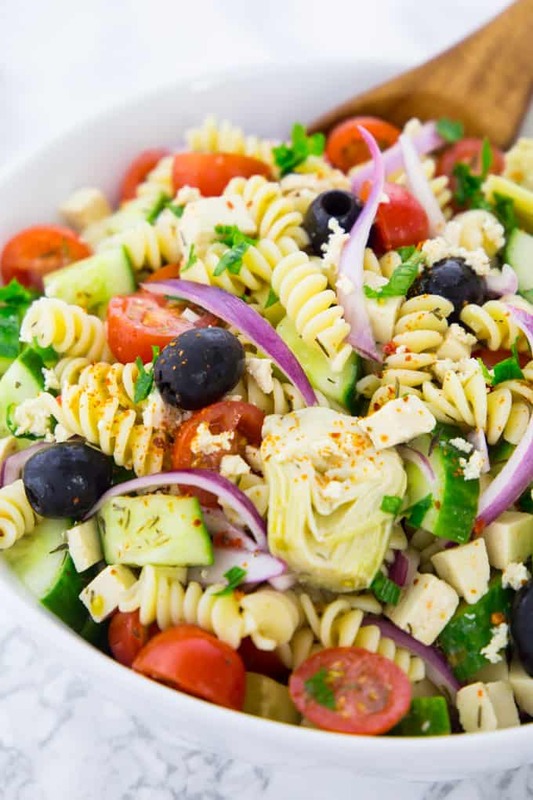 This easy Greek pasta salad is perfect for BBQs and picnics! It's fresh, easy to make, healthy, and vegan. The perfect recipe to make for your next party! First, make the vegan feta cheese: The night before making the salad, cut the tofu into small cubes. In a small bowl, combine all of the ingredients for the marinade. Fill the tofu and the marinade into a ziploc bag and store it overnight in the fridge. If you don't have much time, you could also get away with marinating it for about 4 hours. But it's definitely better if you marinate it for a longer time. Also make sure that you got a very firm tofu. It makes the best texture! Cook the pasta according to the instructions on the package. Set aside and let it cool down a bit (not completely). Chop the remaining ingredients and make the dressing. 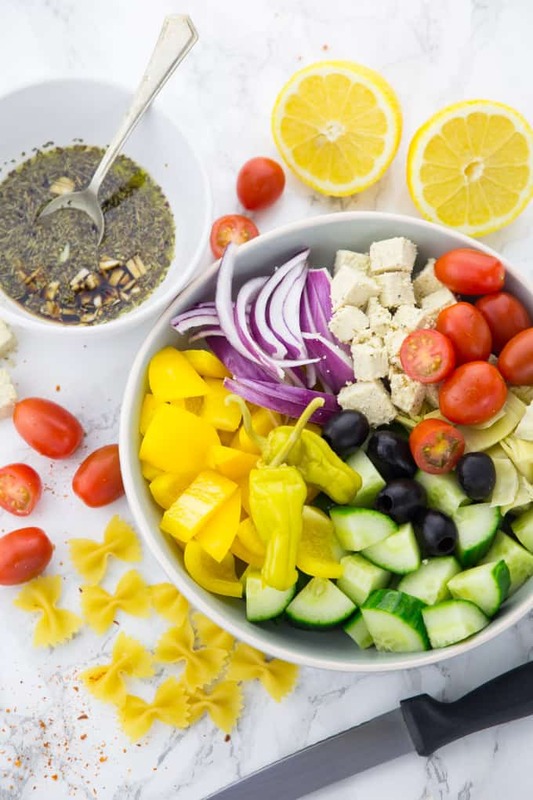 In a large bowl, combine all ingredients for the pasta salad including the vegan feta. Add the dressing and toss. Refrigerate for at least 2-3 hours before serving. This salad includes all of my favorite ingredients. It looks super healthy and tasty. I would love to give it a try. I will so make this salad for our 4th of July BBQ! I just tried it last night and it was amazing. Everyone at our BBQ (including meat-eaters) loved it. Thank you so much. Great recipe! Easy to make. I also added finely chopped broccoli and mmm, it takes amazing!